This was my first time back at Crossfit since my babysitting adventure and it kicked my tush! It went pretty well, even though I was last…as usual. We started with our strength of Front Squats 5x5x5x5x5 (95#) and a couple of rounds of as many burpees as possible in 15 seconds. The most I got was 4, which isn’t too shabby! The up and over box jumps were interesting. Basically, you jump on the box and over the other side. Box jumps aren’t my strongest skill but I’m still glad I can do them than step ups. Now, I just need to work on jumping on the next box up! This entry was posted in Workout and tagged Box Jumps, Crossfit, Deadlifts, Front Squats on November 16, 2011 by Tammy. Cut off time was 25 minutes, so at least I finished. I couldn’t breath today, add that with front squats where the bar is pushing on my neck and you get a crappy workout. I started with 65# but dropped down to 55# in round 2. I did 5 box jumps and ended up modifying those to step ups. In the first round I was already having problems breathing. There was a lot of stopping to catch my breath. My front squats in rounds 3-5 became shallow squats too. No, I didn’t get the depth. The lower I went the more the bar pushed on my throat because I couldn’t keep my elbows up to where the bar would rest on my shoulders. Shane made the comment “I’ll take that any day, all day long.” I think he was happy I was moving instead of standing there sucking air. Everyone cheered me on, which was nice. I’m so thankful our gym is supportive. Not once have I heard a snide comment made toward anyone there. We all do the best we can and try to support the others the best we can. The best I can tell, this seems to be par for the course for all CrossFit gyms which is outstanding! August 23rd can’t come soon enough. I’ll be able to schedule my dilation so I can breathe again! Day 2 of no artificial sweeteners – done! My eating was pretty spot on today too. So day 2 of Primal/Paleo done as well. 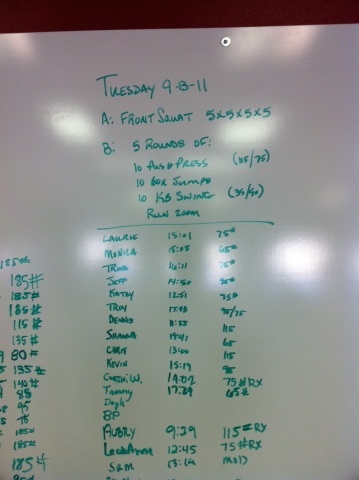 This entry was posted in Health, Workout and tagged Box Jumps, Crossfit, Front Squats, Squats on August 2, 2011 by Tammy. Every time you set the bar down between reps you had to do 3 burpees. You can rest as long as needed between rounds. It was 100 degrees here today and I felt quite overheated between the last few rounds. We need a fan just to get air circulation in the gym. I rested more than I cared to between rounds but I did not want to have to put the bar down to do burpees. I think I was the last one done, or at least close to last, but that’s ok. Yesterday was my weigh in day. I didn’t post the results because I got lazy and was a little miffed at myself. This month is my first gain in the 5 months I’ve been working hard. This really didn’t take me by surprised since I spent all month making poor food choices for the most part. But, it is what it is. I’m not going to dwell on it, especially since I’ve had my eating back under control since Monday. By next month, I should be back down to the 190’s. I’m hoping to be in the 180’s by the time I hit the beach at the end of July. Then, when I get back from there I’ll have two weeks before my marathon training starts. Eek! This entry was posted in weigh in, Workout and tagged Back Squats, Clean, Crossfit, Front Squats, Push Press, The Bear Complex, weigh in on May 26, 2011 by Tammy.